I know I haven’t blogged in a while, but for all of my faithful reader (I know there’s just one of you), here’s what I made for Thanksgiving last night. We decided to stay home and just have a quiet dinner and I didn’t want to just roast a turkey breast, so I did something a little different. I made Turkey Paillard. 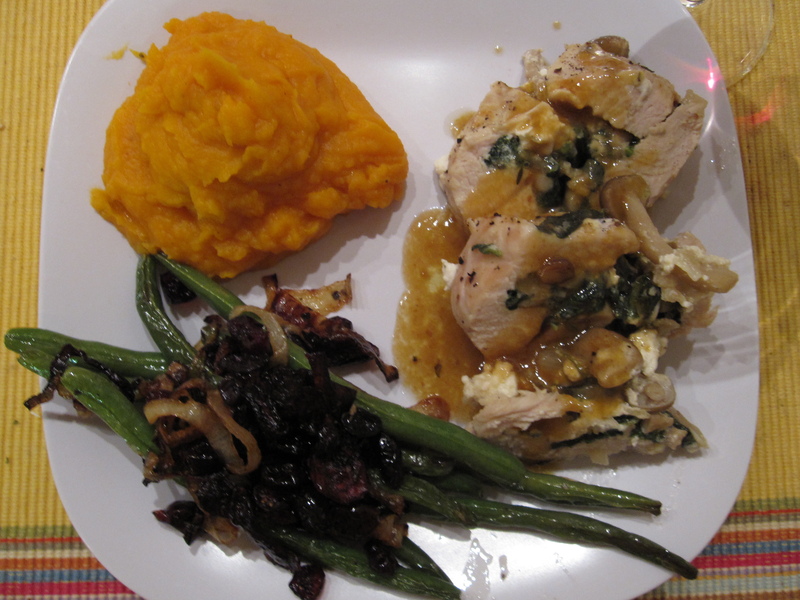 Now, I did have to include a couple of the traditional (I say traditional, yet turkey wasn’t even served at the first Thanksgiving meal) ingredients on the plate being sweet potatoes and cranberries. Otherwise, I kept it pretty simple. The first thing I did was make the stuffing for the paillard. 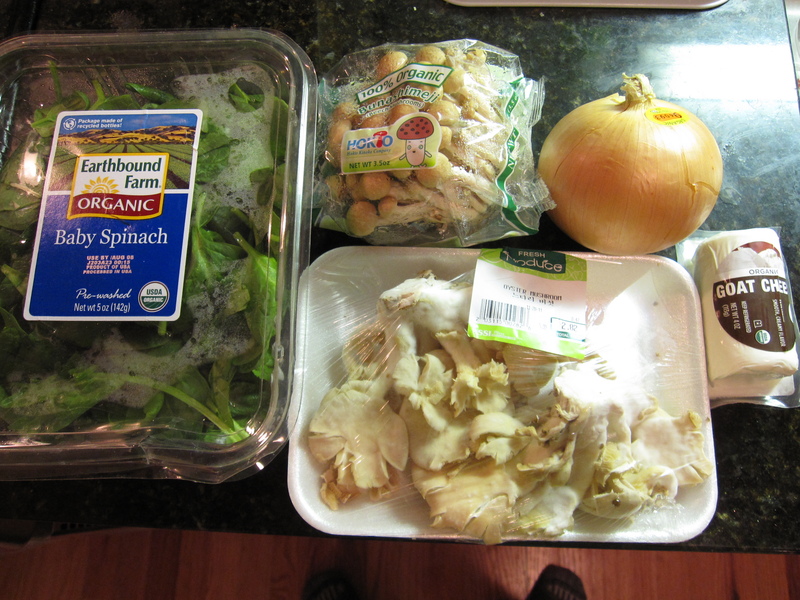 I used about 3oz of baby spinach, 3.5oz of shimeji mushrooms, 3oz of oyster mushrooms, about 1/4 onion diced, 3oz of goat cheese, and three cloves of garlic minced (didn’t make it in the photo). In my hot pan I poured in a couple of tablespoons of peanut oil and sweat down the onion and garlic for about 7 minutes. Then, I tossed in the mushrooms. 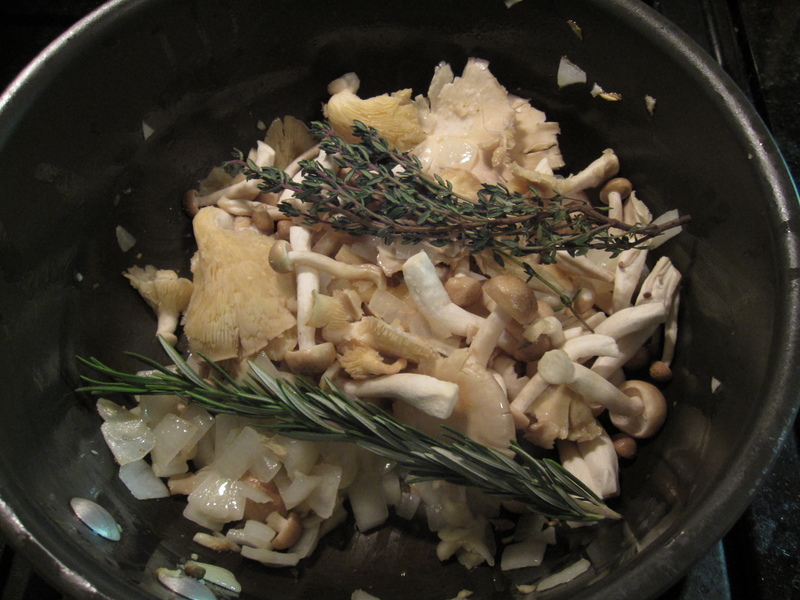 Once the mushrooms were in I decided to add a sprig each of rosemary and thyme to add some depth to the flavor. 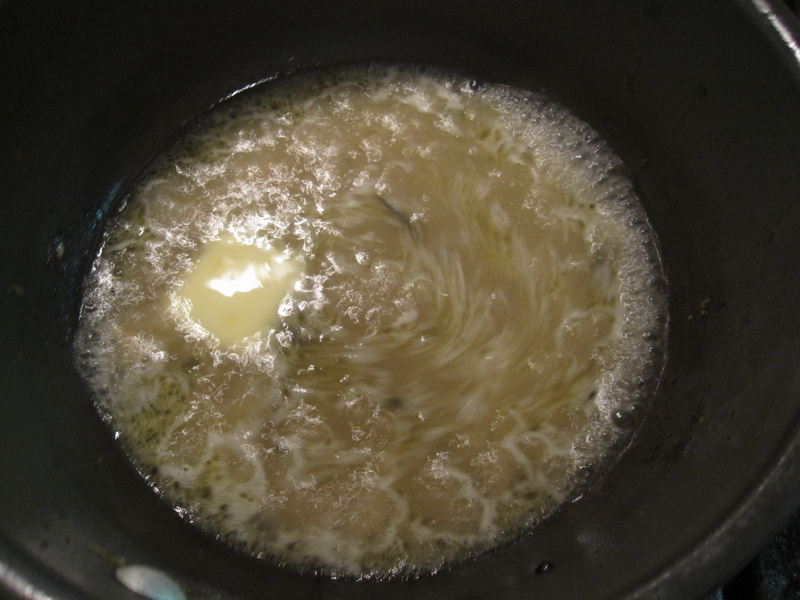 As the shrooms were softening, I decided that some butter would be a good idea, which it was. I added a tablespoon and then seasoned with salt and pepper. When the shrooms were soft, about 5 minutes or so of cooking with the butter, I added the spinach and cooked that down just until it wilted, about 2 minutes. 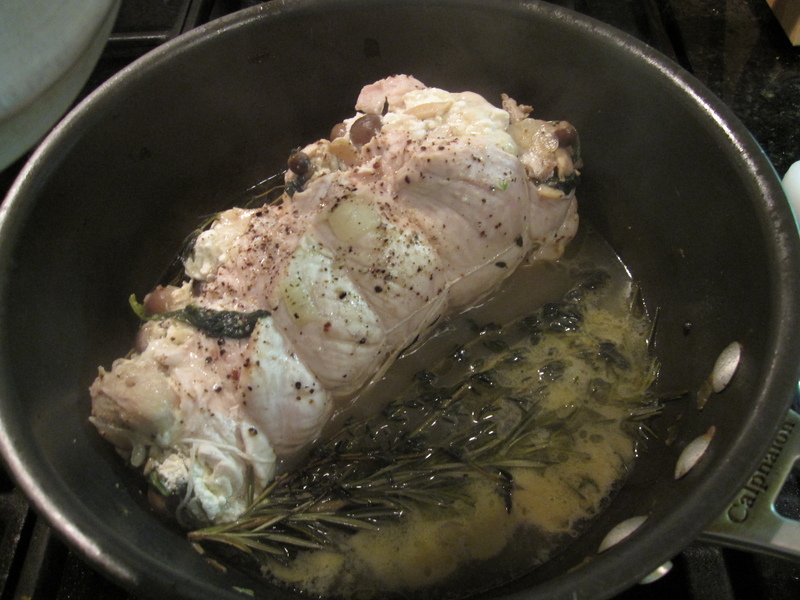 I removed the rosemary and thyme and then let the mixture cool down. 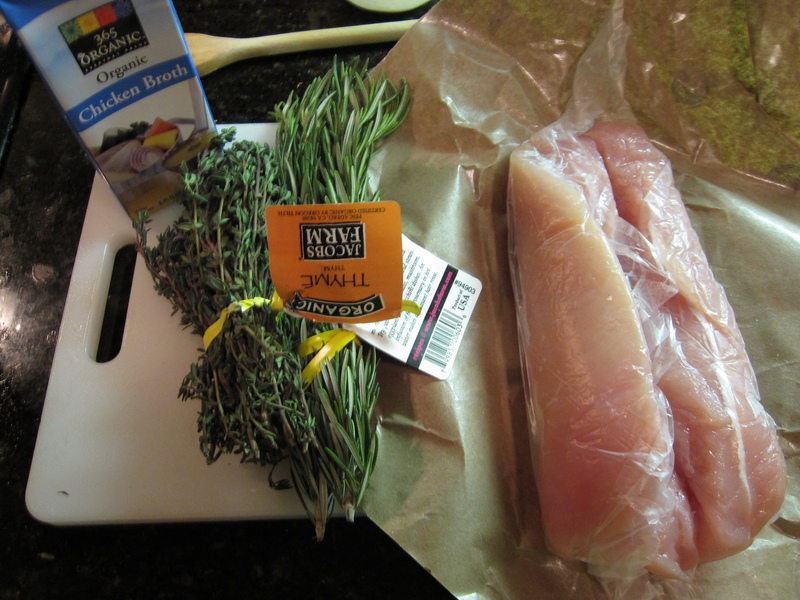 For the turkey I used 1 cup of chicken stock, some rosemary, thyme, and a 1lb turkey tenderloin that I butterflied open. I opened up the turkey and spread the mushroom and spinach mixture all over the inside, leaving about a half-inch border around the edges. 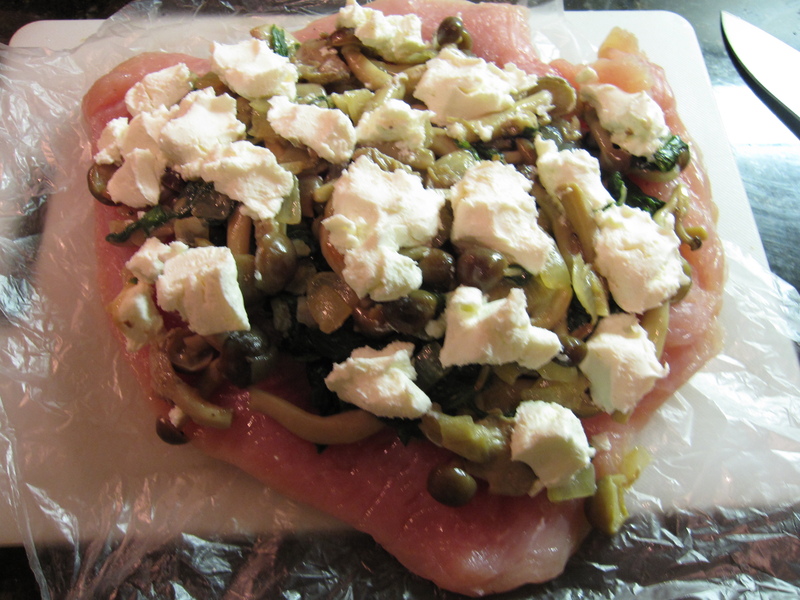 Then I put chunks of the goat cheese all over that. 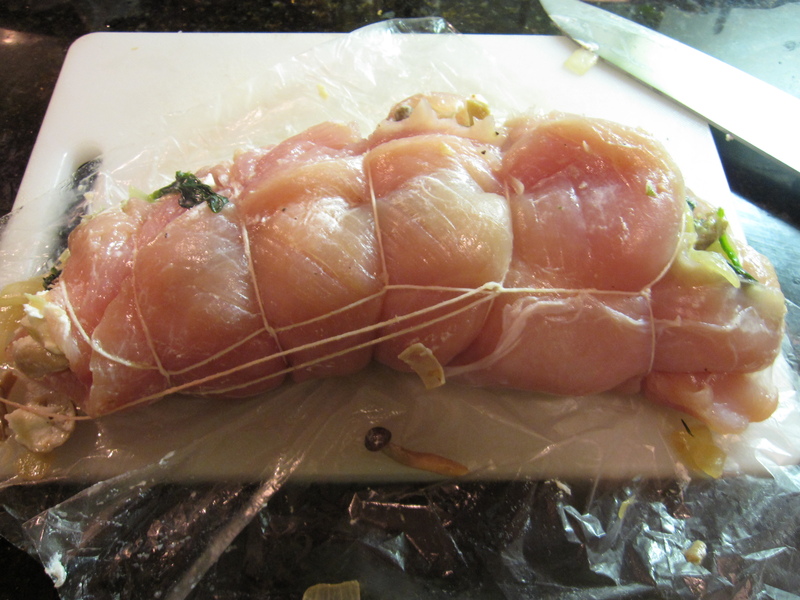 I rolled it all up and tied it with some kitchen twine, then seasoned it all over with salt and pepper. I will say this, it may be the ugliest rolled piece of fowl in the history of Thanksgiving. However, it was so ugly that it had to taste good! I simply put too much stuffing in, but hey, it’s Thanksgiving, you’re supposed to be glutinous. I heated up my pan, poured in a few tablespoons of olive oil, and gently placed the turkey in. Had I done a better job tying the turkey I would have turned it so that the outside seared all over. I didn’t want it to fall apart though, so I just poured in the chicken stock and tossed the herbs on top. Once the stock was boiling I turned the heat down to low, covered the pan, and let it simmer for about 30 minutes. While the turkey was cooking I whipped up my two sides. 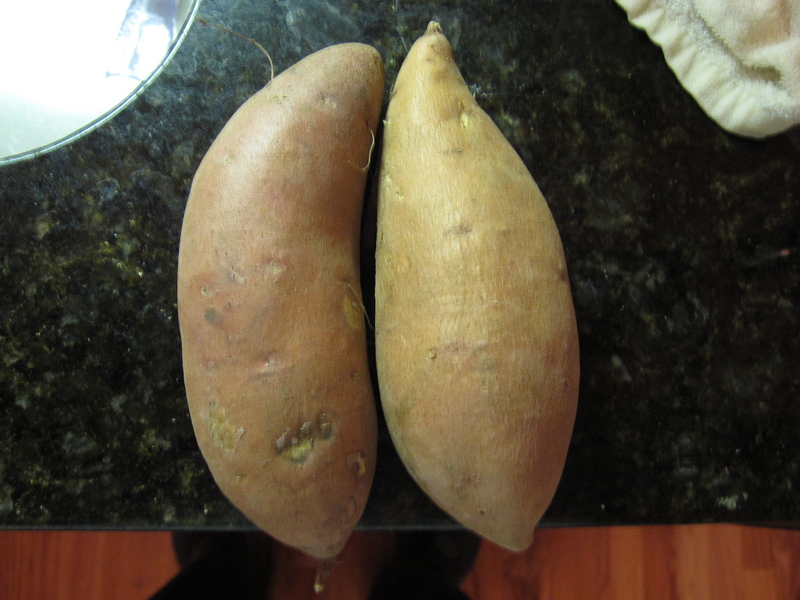 One was a simple pureed sweet potato. I simply steamed two sweet potatoes cut up in cubes for about 15 minutes and then blended them in my little hand blender with a few spoonfuls of the turkey’s cooking liquid. 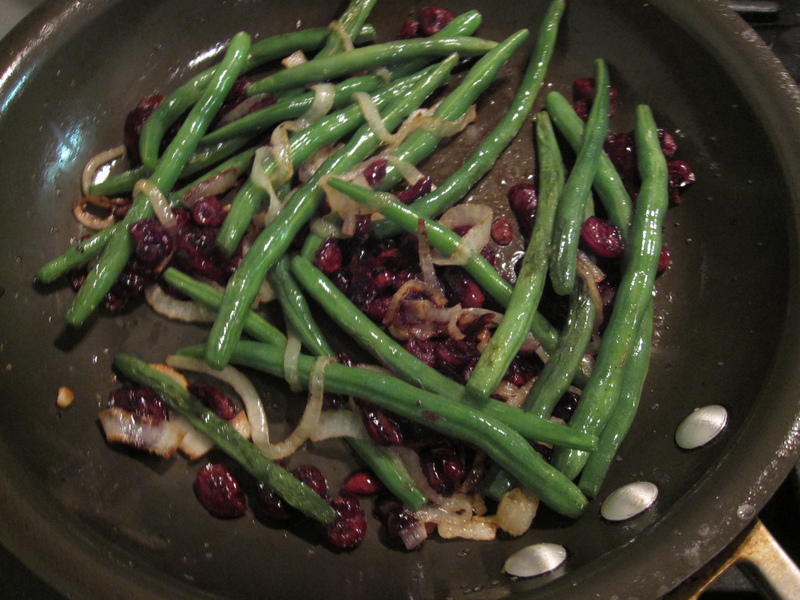 The other side was pan roasted haricots vert with onion and dried cranberries. 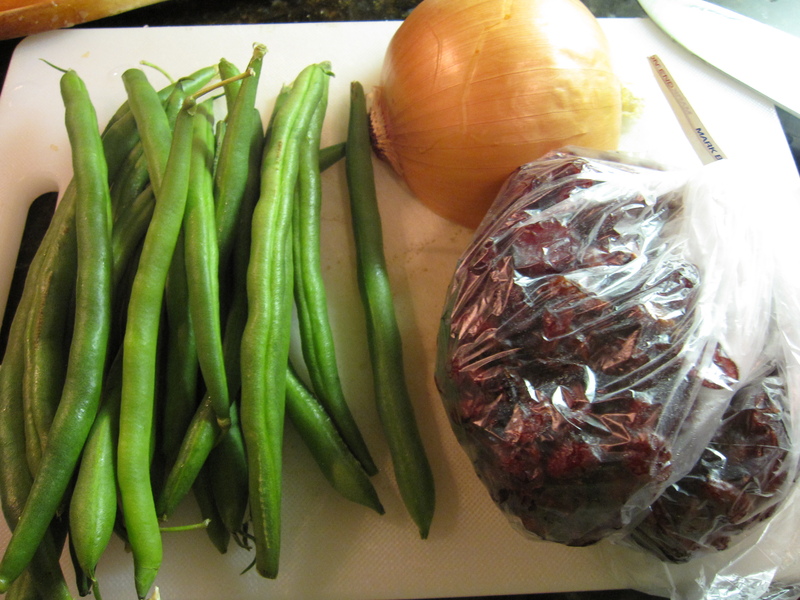 I used a handful of haricots vert, about 1/4 onion thinly sliced, and a handful of dried cranberries. I heated up my saute pan over med-high heat and poured in a couple of tablespoons of olive oil and then added the haricot vert and onion. I let them cook for about 10 minutes until the onion became slightly carmelized and then added the cranberries along with some salt and pepper. A few more minutes and this dish was ready. When the turkey was done I set it aside and tented it with foil. I took 2 tablespoons of butter cut into smaller pats and added them one at a time to the chicken stock that the turkey cooked in with the heat turned up high. Well, first I removed the rosemary and thyme sprigs. As the sauce reduced a little more I added more butter until I had a nice, silky gravy to spoon over the turkey. That was all. A very simple Thanksgiving dinner for two. It didn’t take a ton of time to cook, I didn’t have a ton of clean-up afterwords, and it was much better than a regular old roasted bird. In fact, Yuki even commented that this was the best tasting turkey she’s ever eaten. I noticed that she didn’t say the best looking.